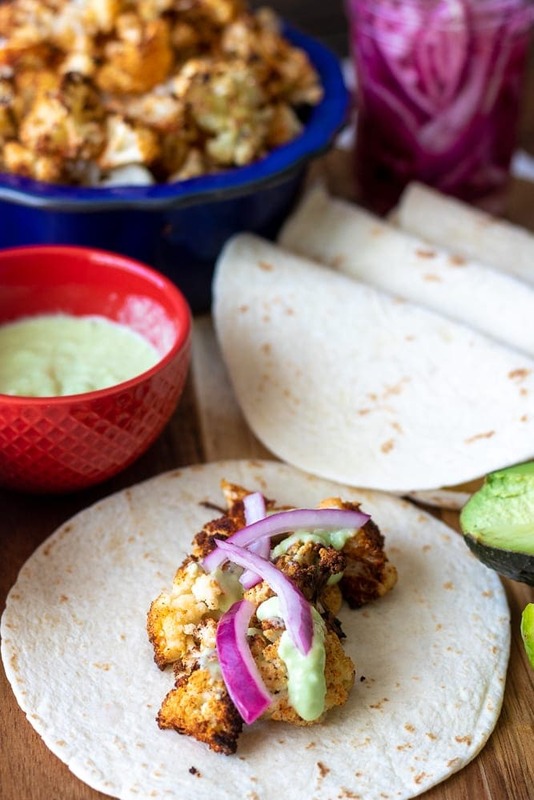 These Roasted Cauliflower Tacos are a fabulous meatless version of taco. 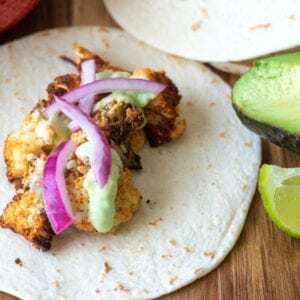 Taco spiced, roasted cauliflower is topped with pickled onions and an avocado lime sauce work together to create a delicious vegan taco. My husband and I have found this great taco place that we like to sneak away to for lunch dates. It was there I fell in love with Cauliflower Tacos. This Cauliflower Taco was made with seasoned roasted cauliflower topped with pickled onions and an avocado lime sauce. These meatless tacos were made with just a few simple ingredients. But it was the attention to the flavors and textures of these Cauliflower Tacos that made these tacos irresistible! Cauliflower may sound like an odd choice for a vegetarian taco, but the roasted cauliflower takes on a meaty texture. And the contrast of sharp pickled onions, with a luscious avocado sauce, these Vegetarian Tacos are not lacking ANY flavor! 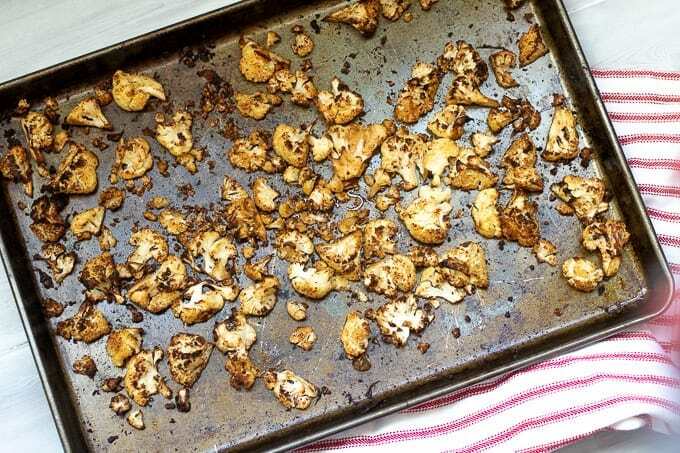 Drizzle cauliflower with olive oil and season with taco seasoning. Roast for 30-40 minutes, until tender and browned, flipping once during the cooking process. Place ripe avocado in blender or mini food processor. Add in fresh lime juice, lime zest, and salt to food processor. Blend until smooth and creamy, scraping down sides if needed. To serve Cauliflower Tacos, place roasted cauliflower onto tortilla or lettuce wrap. Top with pickled red onions and drizzle with avocado sauce. If you are not vegan, these Veggie Tacos are great topped with queso fresco as well. Be sure to roast the cauliflower until tender, browned, and caramelized. That caramelized flavor is essential for the cauliflower taco meat. 1 head of cauliflower is about 3-4 cups florets. Use corn tortillas, flour tortillas, gluten-free tortillas or even lettuce wraps to serve Cauliflower Tacos. Mexican spiced roasted cauliflower is topped with an avocado cream for a delicious and healthy, vegan Veggie Taco. Drizzle cauliflower with olive oil and season with taco seasoning. Spread out on large baking sheet. Add in fresh lime juice, lime zest, and salt to food processor and blend until smooth and creamy, scraping down sides if needed.